Here is a list of specimens that can be observed quickly and easily with your new microscope. Making your own permanent and temporary slides for microscopic observations is an important component of amateur microscopy, but not ever amateur microscopists actively engages in slide making. It depends much on how you interpret the hobby of amateur microscopy. There are permanent slides, temporary slides (including wet mounts), dry mounts, and heat-fixed slides. Sometimes there is an overlap in these categories. 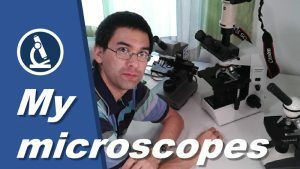 The “best” microscope is the one that gives you the most enjoyment and the one that you use most frequently. The classification of light microscopes into different types does not depend primarily on the quality of the image. The quality of the microscopic image depends on the optics used. The decision process is quite straight forward, most microscopes for beginners have the same features. The microscope head carries the eyepieces. There are monocular, binocular and trinocular heads. Microscopes can be equipped with three different kinds of lamps: halogen, LED and tungsten. Many recreational activities involve the collecting of items (stamps, rocks and minerals, fossils, stuffed animals and trading cards…). Amateur microscopy also offers something for people who are interested in collecting.